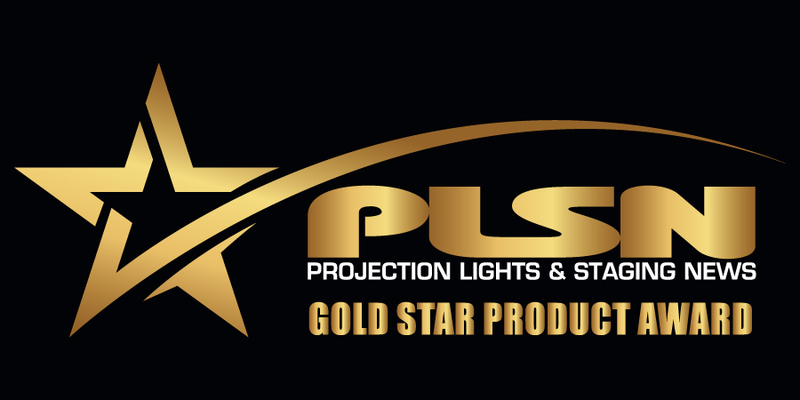 LAS VEGAS – The inaugural PLSN Gold Star Awards honored product manufacturers with a total of 24 awards bestowed, in recognition of each product’s quality, innovation and ability to expand the technological boundaries of live event production. Product categories range from lighting fixtures to video products, software, rigging automation and more. The awards were bestowed earlier this month, during the LDI convention in Las Vegas. PLSN editor Nook Schoenfeld and publisher Terry Lowe met with the winners to present the awards on the exhibition floor. At this time of year PLSN wishes to thank all the manufacturers of quality stage equipment that advance technologocial boundaries and expand our tool boxes with new products. 2017 marked the Inaugural year of the PLSN Gold Star Awards, honoring the manufacturers of premier equipment in a specific theatrical field. 24 separate categories were chosen that encompass various lighting fixtures, video products and handy devices that can be used on a live event. The 24 recipients received their awards last weekend, coinciding with the timing of the LDI convention. The idea for these awards stemmed from the renowned PLSN column The Buyer’s Guide. Each month, the guide lists a certain category of lighting, video or staging gear (such as next month’s column on strobe lights). Each month the editor often found that one particular fixture from a manufacturer would excel over the field.The editor and his writers sat down to a roundtable with a couple of Lighting Designers and stage technicians that know their gear. They hammered out a bunch of categories while jpegs and video links were viewed, narrowing down each field and often recommending new categories. For a closer look at individual product features, please be sure to read the Gold Star Product Awards recap in the Dec. 2017 issue of PLSN.